Club person or not, you can’t deny the power of music and how it can make your hips groove even during your worst days. What’s cool is that we have some of the best places to party, and with that, some of the best people to party to. Anyone familiar with the local nightlife scene would know Goldfish & Blink. This dynamic EDM duo has come a long way and is now proudly representing Malaysia in international music festivals like ZoukOut and DWP. Not only is this pair a must-know, they are definitely what we call Malaysia #REPRESENT. Check out their weekend mix HERE. Known for her smooth fusion of mashups, Eva T is also one of the first local female deejays to perform at Hennessy Artistry in various countries. She charms the crowd with her charisma, upbeat tracks, and insane sense of style. This is why DJ Eva T is someone you can’t miss out on whenever she’s in town. Listen to all of DJ Eva T’s mix on Soundcloud. Casey, also known as Mr.Deadwood, is a fresh but happening self-taught DJ and event planner who started organising a pool party that grew into bigger events with massive turn-outs. Definite proof that passion can lead you to something huge, catch some of his upcoming events outside and show him some love. Follow up on Mr.Deadwood’s schedule on Facebook. Ever wondered what the name stands for? It’s actually an acronym for their former band name called Brains and The Eye. Now that you know that, you should also know how this duo has grown so much over the past few years, they’ve shared the stage with famous acts like Afrojack, R3hab, and Nervo. Stay updated with their latest events on Facebook. 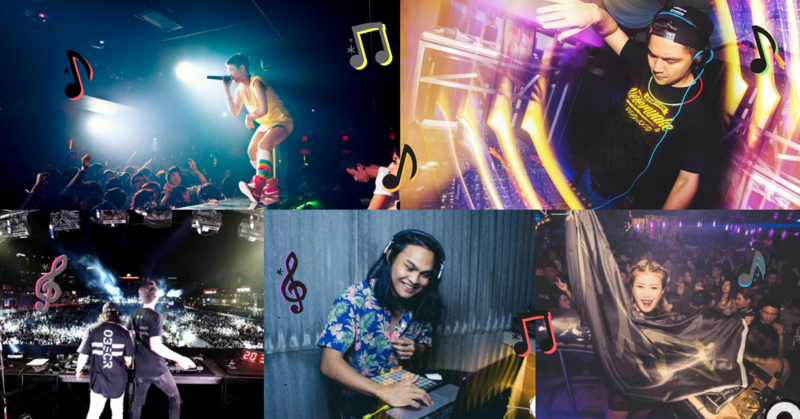 This multitalented deejay, emcee, and overall entertainer can be compared to M.I.A and Nicki Minaj for her flamboyant and infectious style. You will often hear her proud and energetic chants in Malay Sarawak during her shows; you will also be in awe of her rapping skills. Arabyrd is one bird that is gonna keep flying. Listen to her latest mix here. You can’t talk about local deejays without including LapSap, the duo that can be considered one of the pioneers in the country. These guys are not only known for their music, but for their fun pool parties that has been around for many years. They still play for events around town so there’s a chance for you to party with them. Stay updated on their Facebook page. Barista with a contagious smile who also makes music, that description sounds almost too good to be true but that’s exactly who Reddi Rockect is. While he plays at smaller venues and events most of the time, you can also find him behind the deck at music festivals like The Ship and Urbanscapes. Follow him on Instagram for more juice.